Covering definitions, concepts, and applications, Countercurrent Chromatography recounts the developments in two types of liquid-liquid chromatography termed countercurrent-high-speed countercurrent chromatography (HSCCC) and centrifugal partition chromatography (CPC)-as well as the HSCCC-derived cross-axis CCC, a versatile technique for purification in biotechnology applications. The text investigates mechanisms for mixing liquid phases, particularly hydrostatic techniques for CPC and hydrodynamic for coil planet centrifuges. 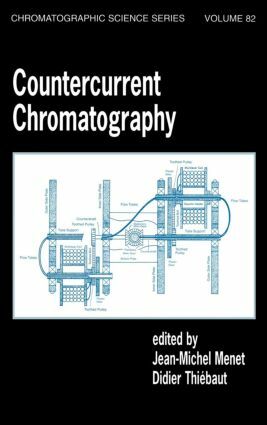 It also explores the use of countercurrent chromatography in inorganic analysis, chiral separation, and the separation of natural products. "…worth reading….All who are dealing with chromatography should study the book…not only for the recognition of the new chromatographic technique but…[to introduce] it to their laboratories as well." Theoretical approaches: characterization of the solvent systems used in countercurrent chromatography; experimental designs applied to countercurrent chromatography - definitions, concepts and applications; coil planet centrifuges for high-speed counter-current chromatography. Apparatus: centrifugal partition chromatography -operating parameters and partition coefficient determination; cross-axis countercurrent chromatography - a versatile technique for biotech purification. Applications: application of countercurrent chromatography in inorganic analysis; chiral separation by high-speed countercurrent chromatography; preparative scale separations of natural products by countercurrent chromatography.